For repairs over large areas, nothing is as efficient as sprayed mortar. Bridges, tunnels and sea defences are just some of the structures where this method of application can be particularly useful. The dry spray technique mixes the water and mortar at the nozzle as it exits. This ensures material can be advanced through long stretches of hose, whilst only dry powder is in the pump or hose. Therefore, pauses in spraying do not have to be accompanied by laborious emptying and cleaning of the equipment. StoCretec dry spray mortars are renowned for their low dust formation and low rebound, essential properties that contribute to more comfortable working conditions and economical application. StoCretec TS 100 - a good sprayable mortar classed as R4 under EN1504-3. It can be sprayed in multiple layers, 50mm at a time, to depths of 150mm and beyond. Once cured it has a fire classification of A1 according to EN13501. StoCretec TS 108 is an R4 class mortar particularly suited to permanent contact with fresh or sea water. 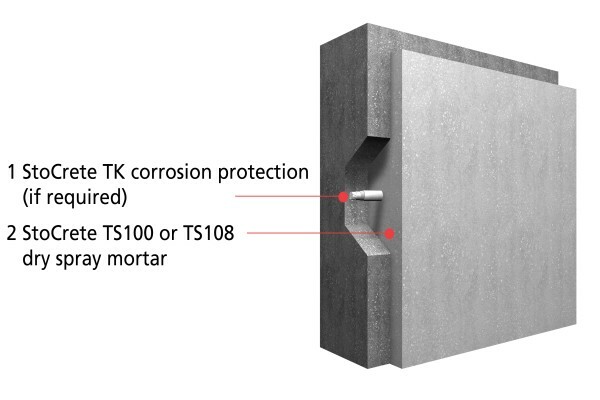 Also with a fire classification of A1, StoCretec TS 108 can be applied in layers of 50mm up to 150mm and more.